Pride FC was filled with a whole host of weird and wonderful characters. The intrinsic link between MMA and professional wrestling in Japan meant even top fighters such as Wanderlei Silva, Quentin “Rampage” Jackson and Fedor Emelianenko were pushed and packaged as wrestling-style superstars, while many of the in-ring competitors came from wrestling backgrounds themselves—“The Gracie Hunter” Kazushi Sakuraba, for example. The anything goes style of Pride draws many parallels to pro wrestling, more specifically the WWF's so-called “Attitude Era.” There’s a reason why reminiscing about both Pride and the late ‘90s/early ‘00s professional wrestling scene produces a steady stream of fantastic nostalgia—those shows were all about the fans and were catered for their respective audiences. One man managed to traverse both Pride and WWF’s heyday: Paulo Cesar da Silva, otherwise known as Giant Silva. Sao Paulo, Brazil, native Silva has many strings to his bow. Standing in at a hulking 7ft 2 ins, Silva carved out a reasonably successful basketball career as a centre and represented his country in the 1988 Olympics in Seoul, South Korea, before heading into the world of in-ring competition—kayfabe of otherwise. Silva’s sheer mass—all 385 pounds of it—was an instant draw to McMahon, who signed him to the WWF in 1998 in the midst of the Attitude Era. If you want an idea of the sheer captivating nonsense of that time in professional wrestling, look no further than the above video. Silva was aligned with The Oddities—a wrestling stable so Attitude Era it hurts. A team of so-called “freaks” which featured the likes of Golga, a giant man wearing a gimp mask and ill-fitting clothes while carrying around a stuffed Eric Cartman toy, and the overbearing Juggalo kings the Insane Clown Posse. As odd as it sounds and looks, this stable perfectly encapsulates the wrestling craziness which drew me in as a fan in my younger years—a joy clearly replicated from those fans in attendance featured in the above video. The Brazilian’s WWF adventure didn’t last long. Despite his stable achieving unexpected popularity, The Oddities were disbanded fairly promptly. But, in the case of Silva, he simply couldn’t wrestle. His size meant he wasn’t the most graceful man in the ring and his appearances inside the squared circle were largely limited to an entourage capacity, which would sometimes see him attack opponents while acting his team’s cornerman. In the early months of 1999, Silva was cut from the wrestling promotion. The wrestling dream wasn’t over for Silva—he went on to perform at New Japan Pro Wrestling and later Hustle. But, it was this relocation to the Far East which attracted Dream Stage Entertainment—the ill-fated team behind both Pride FC and aforementioned wrestling promotion Hustle. Unlike many of his Brazilian contemporaries, Silva had little martial arts experience to draw from. He had claimed in the past that he trained Brazilian jiu jitsu with the likes of Ricardo and Ralek Gracie, but this was and remains unverified. Silva was thrown to the proverbial wolves and was expected to fight experienced American heavyweight Heath Herring on his professional debut. Silva’s above interview with Mauro Ranallo, who has since made the reverse transition from commentating on MMA to WWE’s Smackdown brand, was perfect. Silva didn’t have a strategy against Herring. But, from sheer size alone, he managed to take Herring to a third round. Unfortunately for Silva, he succumbed to the rear naked choke of Herring, having been chopped down with a series of uncomfortable-looking leg kicks which forced the big man to try and take the fight down to the ground. Despite losing his sole MMA fight, Silva was entered in the 2004 Heavyweight Grand Prix tournament in classic Pride fashion. As stupid as it would have sounded at the time, it was impossible to predict who Silva would be fighting. Would it be Mirko Cro Cop? Fedor Emelianenko? Antonio Rodrigo Nogueira? Nope. It was against sumo wrestler Henry “Sentoryu” Miller. Silva’s sophomoric showing proved successful. Miller opted to neutralise Silva’s height and reach advantage by taking the fight to the floor. Miller, frustrated at Silva’s surprisingly effective ground defence, moved to side control only for Silva to slap on a kimura and force the submission. Unfortunately for the Brazilian, Silva’s dreams of becoming the Grand Prix champion were dashed in the next round, having lost by TKO to former world judo champion Naoya Ogawa. In all of Silva’s exploits in both professional wrestling and mixed martial arts, one incident stands out to me the most. It was in his next fight, against fellow wrestler Takashi Sugiura of NOAH fame. Billed at a height of 5ft 8ins, Suguira used his wrestling ability to nullify Silva’s size advantage by taking him down. It didn’t last long on the ground—in fact, the fight didn’t even make the three minute mark. Silva suffered a TKO loss to the hands and knees of Sugiura, who used said limbs in a frenzied attack to end Silva’s night. However, Silva clearly took umbrage to the manner in which he lost. Whether it was a professional wrestling-style work or a legitimate case of sheer rage, I don’t care. Silva somehow sourced a giant wooden stick to attack Sugiura and it took what looked like twenty Pride officials to restrain the Giant from beating Sugiura to a Ken Shamrock-esque living death. Things didn’t get much better for Silva in his fighting career. The Brazilian lost and was finished in another three fights – starting with the submission loss to South Korean Choi Mu-Bae, a TKO loss by way of brutal soccer kicks against burly Brit James Thompson and a TKO loss to the much-smaller Ikuhisa Minowa with a series of horrific-looking knees delivered to both the body and the head while on the ground. Those last two losses were particularly hard to watch. Silva was now being used as a static target to help build up Pride’s other stars. This was always the case, but it had never been so blatant until when the diminutive Minowa mauled Silva in a matter of two and a half minutes. Age and a creaking body had well and truly caught up with Silva—and that’s a man who wasn’t particularly agile in the first place. Minowa, meanwhile, helped build and add credence to his name as a David vs. Goliath figure off the back of defeating Silva. With a record of 1-6 and coming off a string of knockout and submission losses, it appeared unlikely that we’d see Silva competing in MMA again. He was promptly expelled from the Pride roster after the Minowa fight. But, it was soon announced that he would face off against another sumo wrestler in Hawaii-born Akebono Taro at K-1 and HERO’s annual New Year’s Eve extravaganza: K-1 PREMIUM 2006 Dynamite!! This would prove to be Silva’s last appearance in professional fighting and his final bow was on a maginificent stage. Fighting at the Kyocera Dome in Osaka, Japan, in front of over 50,000 in attendance, Silva finished his fighting career as he had (almost) begun—submitting a sumo wrestler with a kimura. Akebono sought to utilise his weight and pressure Silva against the ropes to bring the fight to his world. This fight was the first time Silva had ever faced an opponent heavier than he was so this seemed to be a smart strategy. That weight advantage didn’t count for much, though. Silva broke from Akebona’s bear-like grip in the clinch to secure the right arm of Akebono’s, beginning the kimura before taking the fight to the floor to twist and contort the elbow and shoulder joints to force the submission victory. It was only Silva’s second win in an eventful, yet brief, three-year MMA career. But, seeing Silva facing off against a sumo wrestler was a perfect way to end things. 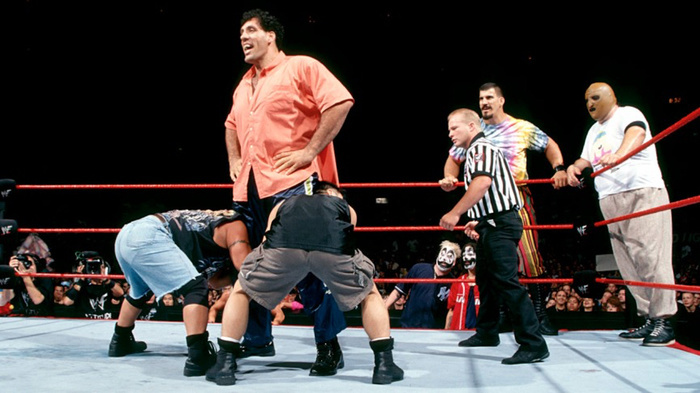 Giant Silva may not be a man you associate with Pride nor the WWE’s Attitude Era. If you do, your memories may not necessarily hold him in the highest esteem. But, it’s undoubted that Silva’s presence in both capacities perfectly summed up the wild nature of both industries at the time.